With beautiful photographs, both modern and archival, this cookbook presentsThis book the history, little-known culinary heritage and food traditions of the over two-thousand-year-old Yemenite Jewish community, as well as the changes that followed immigration to Israel in the 1950s. Notable is the strong impact of Yemenite cuisine on today’s Israeli food scene. 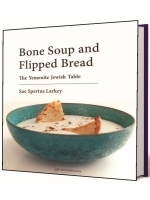 A chapter on the indispensable Yemenite larder is followed by three sections devoted to everyday recipes and recipes for foods that traditionally accompany life-cycle events and holidays. These are prefaced by descriptions of the many colorful customs central to the celebrations, Yemenite cooks’ personal stories, tips and above all, their deep desire to preserve their beloved food heritage. The book concludes with informative appendices and an extensive bibliography. This book includes over a hundred traditional recipes for everyday, the life cycle and holidays and appendices including kitchen information, chronological guide, maps, shopping guide (where and how to purchase products), recipe index and an extensive bibliography.